Many foreigners in Thailand do not understand the use of the usufruct as well as they think they do. If you are looking at using a usufruct for property then speak to one of our property attorneys in Thailand with regards to the registration of the usufruct. These are the basics of Thai property law in Thailand with regards the usufruct. One of the advanatages of a usufruct in Thailand is that it does made provision for 30 year use and enjoyment of the property. The usufruct will be registered against the title deed of the property in Thailand. With the usufruct also comes the right but also resposibility of the property. This is about as close you can come to ownership without having ownership of any property in Thailand. Thai law is very restrictive when it comes to owning a villa in Thailand or land however the use of a usufruct will normally be able to negate this limitation. If you are looking at living in Thailand outside of buying a condominium then the usufruct might be of use to you if you want the use of a large piece of land or the use of a large home. Usufructs last for 30 years however unlike a lease this usufruct will still be valid after your death. Hence your wife or children may be able to make use of the agreement after your death unlike the lease. Before you invest your nestegg in any property or real estate in Thailand seek proper legal advice before signing any contract. Seek the advice and guidance of a property attorney in Thailand with a reputation and the expertise that you need. Speak to any of our property attorneys in Thailand with regards to property agreements and the use of the usufruct and it limitations and benefits. Speak to us today at any of offices in the Kingdom be it in Bangkok, Samui, Phuket, Pattaya or Chiang Mai. 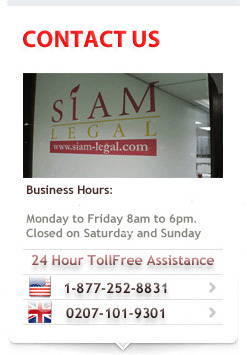 With offices in all the major tourist cities in Thailand we at Siam Legal will best be able to serve your needs.